Luxury accommodation at budget prices! We have a 100' large screen projector with all channels in our living area, free WiFi access, a garden with a BBQ, big communal areas and a large kitchen with a big help-yourself breakfast included. All rooms have a fridge, TV, and free WiFi access. Free rice and pasta are provided for each guest every day. We have a fantastic kitchen with included breakfast and not just any old breakfast too! All you can eat six cereals, juice, raisin toast, white toast, multigrain toast, espresso coffee, and tea. We have fast internet computers and WiFi throughout the building. We've added a female dorm with a balcony that has all the things a lady needs in the room. Come and see why we are consistently highly rated by our guests. Check-in is 2.00pm: Check-out is 10am - if you arrive early you can leave your baggage with us from 8am when reception opens. Built as a large guesthouse in the late 1800's, we have over fifty mainly private rooms and offer nightly or weekly accommodation at great value. We have a fantastic location just on the southern side of the city, in the heart of South Yarra which is home to the beautiful Botanical Gardens and many trendy restaurants and bars. You can walk through the park and along the Yarra river to get into the city or you could just hop on the tram which takes about 5 minutes. 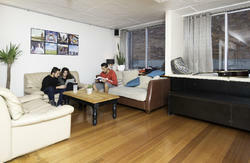 There is shopping and dining to cater for all budgets along Toorak Rd and Chapel Street. The number 8 tram runs along our street so everything is only a short ride away - St Kilda's fashionable restaurants and beaches, the city, the Melbourne Cricket Ground and Albert Park - home of the Melbourne Grand Prix. All trams and trains are within walking distance. We have over fifty rooms which vary in size from small singles to large doubles, budget twins, family rooms, a few dorms (most of our dorm rooms have a balcony) and are well equipped with a colour TV, fridge, kettle, heater, wardrobe and dressing table. 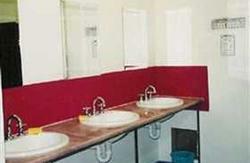 None of our rooms have en-suite bathrooms but there are plenty of bathrooms located close by in each corridor. 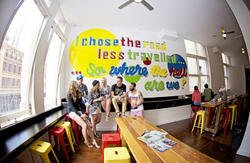 Why not escape the madness of the backpacker hostels as we offer a better class of well priced nightly accommodation to backpackers, 4 bed dorms or your own double/twin/triple room.